Picking out a fresh new design for your bathroom walls is one of the biggest aspects of the renovation process. While you'll probably have visions of various tile designs in your mind, it's worth paying attention to what your alternatives are. We've spotted a growing trend for bathroom wallpaper recently and this guide will talk you through exactly why you should consider it as an option. Why should I choose wallpaper? 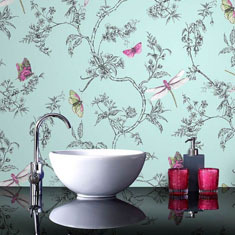 Bathroom wallpaper is a great alternative for several reasons; if you are working with a tight budget for example it removes the need for any ceramic tiles or grout which can become expensive depending on the size of the room. Now you might think that this might be a bit of a challenge, however it's nowhere near as hard to work out just how much wallpaper you're going to need as you might think. The first thing you should do is measure the width of each wall that will be covered in the new wallpaper and then divide this by the width of the roll (the usual width in the UK is around 53cm but yours may differ). You then need to measure the height of the room and multiply this with whatever number you got for the width. Also don't forget to take windows and doors into account if you're using wallpaper in these areas. If you're still struggling then you can find numerous 'wallpaper calculators' online which will make this process even simpler. It's also worthwhile getting around 10% extra just in case you have any mishaps; remember to get enough paste too! Do I need to worry about batch numbers? You need to be aware of them yes. Each roll will display a batch number. These need to be consistent to avoid any noticeable changes in colour or pattern appearing (different batches can sometimes be slightly different from each other). This is another good reason to buy extra rolls because if you make a mistake and the particular batch you have is no longer available you may have to redo the entire room! How easy is it to hang wallpaper myself? It's honestly not all that difficult if you're into your DIY, and it's certainly easier than tiling. Plenty of people have attempted this at some point (though some more successfully than others!) Work slowly and methodically around the room and you should be ok. Just keep in mind that as it's going in a bathroom you'll need a specialist paste to avoid any peeling. If you're not particularly keen on the idea of tackling the job yourself however you can always contact a professional to take care of it for you.